A few year's ago there was a surge in the number of bottles on the wine shop shelf with metal screw-caps. It looked a bit strange on wine but as we were told at the time they were better for the environment in comparison to cork, which apparently damaged vegetation as it was extracted from the earth. So we bought it. It seems this is not the case at all. "People may have heard misguided campaigns before... there was one about eight years ago, claiming cork harvesting was destroying a vital habitat. In fact, it's preserving it." Vanessa Linforth, who manages the Soil Association's forestry programme for the Mediterranean recently commented to the BBC. Cork is natural. 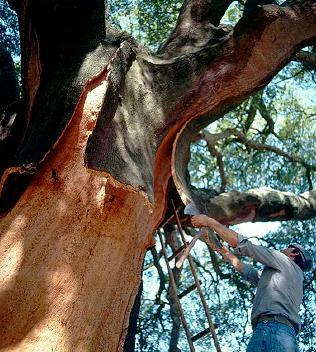 It comes from stripping oak trees of the inner layers of bark which then grows back for farmers to strip a decade or so later. This is done gently to avoid permanent damage to the tree trunk so that the same trees can be used time and time again. They are not cut down and surrounding vegetation is not impacted as has been believed. Wildlife surrounding the trees can, if fact, flourish. Farming cork is actually quite a sustainable practice and has prevented desertification from creeping in to areas of the Mediterranean where it is sadly becoming more prevalent. Metal screw caps and plastic bottle stops are not the greener answer. They also don't make for a better tasting wine. Wine is able to breathe a little when a cork is used as a very small amount of oxygen seeps through, allowing a fine wine to age better.